well hi there! february is here and valentine's day is coming and that means my house looks like a pink and red explosion but i am digging it. 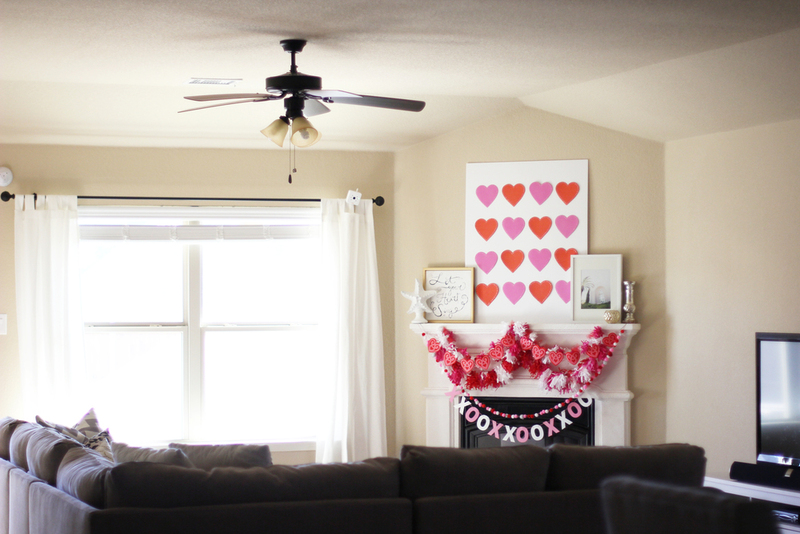 pretty much all of my valentine's day decorations are diy projects and i am really excited to share them with you! i made the tissue paper garlands last year and found the heart garland at the dollar section of target last year also. it came on some cheap looking ribbon, so i clipped the hearts off and re-strung them on some bakers twine and i like it a lot more. i made the pompom garland last year and was sent the xxoo garland from black label decor -- thank you again, i love it! i am in love with that classic black and white striped ribbon and wanted to use it somewhere, so i found the hearts on my chairs at michaels and thought they would be a cute festive touch. i also used the strung garland i made from dollar store goodies on my chandelier and made little medallions out of scrapbook paper also from the dollar section at target and table scatter hearts from the dollar store. can you tell i am really into spending only $1? also, did you notice we got a new sectional? it was quite a fiasco but we ended up pocketing $200 more than what we paid for it (score!) and we are loving our new couch. it's a lot bigger and comfier and that is good because we watch a lot of netflix. also, david accepted a calling to wake up at 5am every week day and teach high school aged kids about the gospel. is he crazy, you ask? probably. but that's why i like him.